If you aren't already familiar with the longrunning Something About the Beatles podcast, it can be heartily recommended - always assuming, of course, that you are the kind of person likely to be drawn to a regular programme about that much-discussed group. One of its cofounders, Richard Buskin, left the show a few months ago, and I miss the give-and-take between him and Robert Rodriguez, now presenting solo, which was a considerable part of the podcast's appeal: the effect was of an occasionally spikey conversation between two friends, each acutely aware of the other's predilections and never above some affectionate mockery. Anyway, there is a large archive of podcasts - 140 to date, between one and two hours each - to allow you to come to your own conclusions. When they are taken as a whole there's no doubt it's a considerable achievement when compared to other workers in the same field: pains have been taken throughout in the hunting down of recordings, outtakes, isolated tracks and interview snippets, and shows are usually long enough to feel that the chosen topic has been covered in satisfying depth. My introduction was a programme about the life of Mal Evans, which seemed admirably even-handed (and which I happen to know was enjoyed by a relative); thereafter I gorged myself on the archive for several weeks, delighting in new discoveries and the acquiring of a more keenly appreciative awareness of aspects of a group whose achievements I thought I already knew backwards. Should they read this, I'm very grateful for the industry of both gentlemen - and, I suppose, Fate: the discovery of this resource coincided with a period of enforced exercise suddenly made tolerable and even enjoyable, as I lost myself in Ringo's isolated drumming or some early rehearsal tapes ... which it strikes me is not the kind of phrase normally seized upon for use as a testimonial. But I digress. The main reason for bringing the programme to your attention just now is that the latest episode features Michael Hill, who has a small but significant role in Beatle history. Mr Hill was mentioned in this blog some aeons ago in Gnome Thoughts ... , a series of posts speculating about David Bowie's early musical influences. When I heard it, it was so great I couldn’t speak. You know how you are torn. I didn’t want to leave Elvis. We all looked at each other, but I didn’t want to say anything against Elvis, not even in my mind. How could they be happening in my life, both of them? "Thank you, God", I said. There was a difference between them. But I thought about it for days at school, of the labels on the records. One was yellow and one was blue, and I thought of the yellow against the blue. I bought it in April 1956 in Amsterdam. 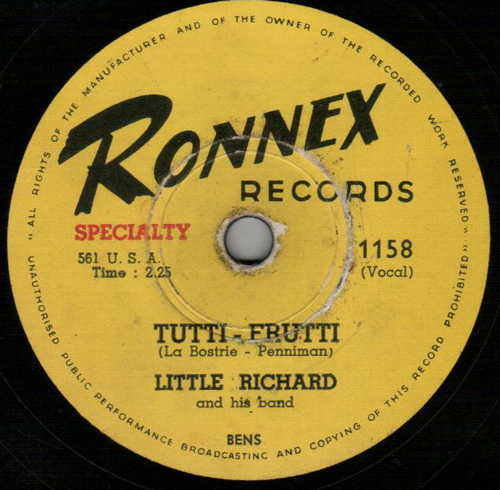 It was a U.S. printed record on the Ronnex label. I hadn’t heard it until I got to Holland. I think my Dutch friend told me about it but I am a bit hazy about that. 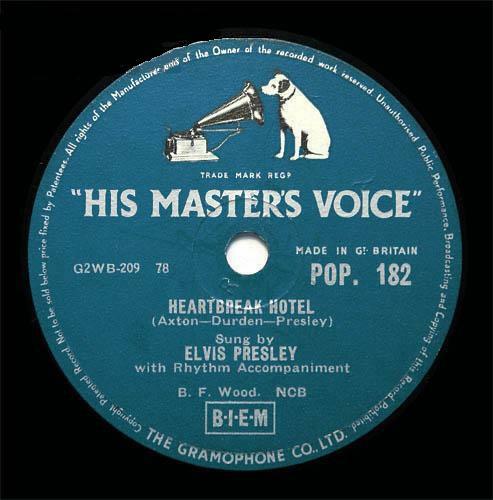 It may well have been released in the U.K. before or after April 1956 but wouldn’t have got any air play on the U.K. radio (stuffy BBC only) in those days. It made a big impact on me and I couldn’t wait to play it for John when we got back and returned to school after the Easter holidays (during which we’d been to Holland). I was sure it would knock him out and it did. Fancy him remembering all those years later his exact words to us when he first heard that record. Just shows what a tremendous life altering impact it had on him. It’s no coincidence that this very same number "Long Tall Sally" opened their first U.S. concert and closed their last one. Above is a British 78 of Heartbreak Hotel on HMV and a Belgian 78 of Tutti Frutti on Ronnex, both 1956. I have now listened to the podcast, which is a good 'un. The book, entitled John Lennon: The Boy Who Became a Legend, was warmly endorsed by Robert Rodriguez. Of course there are numerous books around written by any number of more or less Beatle-ish people, but the podcast conversation suggested that Mr Hill has a stronger case than most. He made the point that he didn't want to embellish his memories, and has quoted and acknowledged others, presumably schoolmates, who were also around at the time, so it seems it's as much about conjuring the environment which shaped the young Lennon. It's particularly interesting to hear his thoughts on Pete Shotton's and Cynthia Lennon's books (two in the case of Lennon's first wife); he has vouched for their accuracy in both cases. There is also a nice distinction made: when Rodriguez talks about Lennon's time with Cynthia overlapping with the friendship with Hill, the latter replies no; they dovetailed. But it does mean that he is in a better position than most to attest to the reliability of Cynthia's description of Lennon the art student. This particular SATB episode also illustrates what I said earlier about the podcasters' taking pains: we hear relevant sections from interviews in which Lennon discusses his first exposure to Little Richard and remembers both sides of the single; Hill makes the point that the Scouse accent employed in Lennon's smack at Dylan, Serve Yourself, was something they could all do but was consciously put on and he notes that Cynthia says she didn't detect a strong Liverpool accent when she first met John. It is also interesting to hear that although he spoke to Mark Lewisohn for the first volume of his mammoth biography Hill already had the idea of a book in mind and was careful not to share everything - a case, I suppose, of The Man Who Didn't Give Too Much About a Future Beatle Away (to my ears a far more mellifluous title, but let it pass). 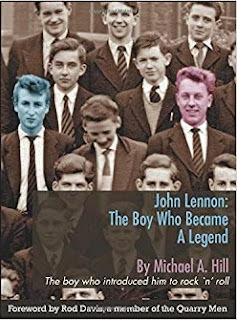 I didn't realise, or had forgotten, that the film Nowhere Boy is based on the second memoir by Lennon's half sister Julia Baird; Hill also spoke to her when she was preparing her book, though once again was careful not to share everything. Which would seem to add further credence to Michael Hill's book, which can be bought via his website here. I must stress that I haven't yet read it but on the strength of this podcast it certainly seems worth investigating. 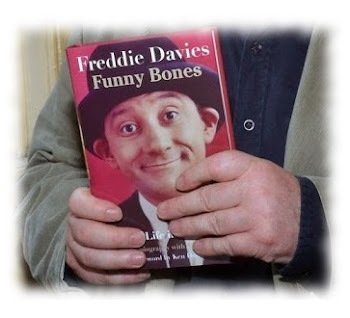 I have read, and remember enjoying, a library copy of Pete Shotton's book over thirty years ago; secondhand copies are now so pricey, however, that I probably won't revisit it. 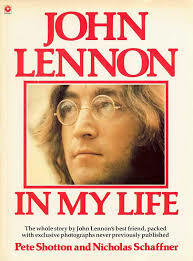 Specific memories of its contents are vague, although they include an incident involving Shotton, or possibly Lennon, p*ssing himself with laughter as a schoolboy, a detailed account of who contributed which bits of lyric to Eleanor Rigby and the Spanish holiday disposed of in doublequick time. 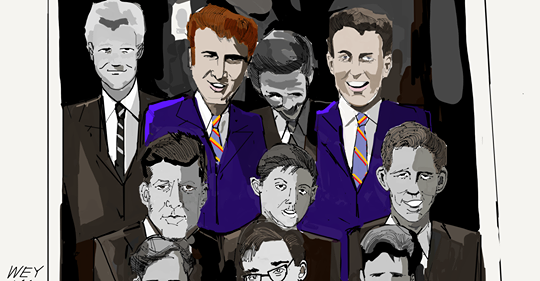 It's ghosted but you feel inclined to believe in the character portrayed. It would be interesting to make a close comparison of Shotton's and Hill's accounts; by Hill's own admission although they and another boy made a regular, mischievous foursome, they were also two distinct pairs, and it was Lennon and Shotton rather than Lennon and Hill who made up one of those couples. I was late, and wasn't allowed to enter the cinema as I was just over the thiry minute limit. I wanted to scream: It's not fair! I'm going to appreciate it more than her, what with my extra knowledge about the Beatles, having read all the biographies including the "spurious" one - I've even got a complete book about the "Paul is dead" theory - I mean, c'mon. But (of course) I didn't. I walked away and mooched around in bookshops for an hour. There was, however, a reward of sorts later, when she emerged from the cinema and spoke these words: "I'd forgotten she was run over." But the feeling I had at that moment - an unlovely male sense of superiority about being in possession of more Beatle fax'n'info, basically - vanished in the act of writing this down. Full post about Nowhere Boy here. "Gnome Thoughts", a series of 38 blog posts about David Bowie's early musical influences, has been cited in Chris O'Leary's song-by-song Bowie book Rebel Rebel; a guide to all these posts can be found here. The Something About the Beatles website, with downloadable podcasts, can be found here.